A few years ago I spent a very happy afternoon listening to the reminiscences of Hugh (known as Sam) Abbott, who was born at Lyndhurst, Ashburton in 1935. Afterwards I wrote up all that I could remember of that meeting. Sadly, Hugh died in January 2011 - but I think he would have enjoyed sharing his memories with a wider audience. I have written it as closely as possible to his own words. Following this are memories from: Ernie Smerdon, Margaret Ledbury and Mary Reeves, Pat Blayney. 'Harold Abbot was at Lyndhurst first * He came from Bowdley Farm. Francis William Smerdon (Frankie) Abbott, my father, lived at Lyndhurst. The building opposite the house was stabling for a horse and carriage. There was a kitchen and scullery, with a larder and a copper. I remember huge bowls being hung on the back wall. We had a piano in one room, and a grandfather clock in the hall. There was a bathroom upstairs, but the hot water had to be carried up for it in large watering cans with lids. I heard a story that the bottom newel posts in the hall had, at one time, glass globes on them, like upside down fish bowls. One day the sun shone through the hall door and through a globe which acted like a magnifying glass. It caught the stairs alight. Frankie owned Rew Lea Cottages, and eventually moved to Woodawray. My grandmother lived with us. There were evacuees in the house during the war - my mother used one of the bedrooms as a food store, and had food piled from floor to ceiling. Frankie was a Special Policeman at this time. I remember someone called Roberts at Cartlands - he had Raj connections. Miss Manlove was at Moorlawn. Colonel Rendell was at Torns - the hunt met there. A Nosworthy ran the newsagents - I think Harold's wife was a Nosworthy. *** There was some connection with the Langler family, who owned what became Webbers and Christophers' yard. The three daughters then sold Lyndhurst to a couple from the Belgrave Hotel'. I lived at 69 North Street – my mother was born in the houses opposite (now demolished – these were where the strip of pavement is now). The Routley family lived in no. 92, and the Wottons in 94. Going back the other way The Gill family were in no. 90 and the Endacotts in 88. Our house was large – we had 6 bedrooms. F J Badcock had lived in it once, and still owned it. * During the war, when we had evacuees, there were 14 in the house altogether. We used to pick flowers and berries and sell them house to house. First of all in the year it was snowdrops, then daffodils from Lent Hill and primroses from Goosible Lane (sp? )** Later in the year we collected 'urts and chestnuts. Bluebells were no good for selling – they didn't last. I used to save with post office savings stamps – they were 6d a time. In those days it was considered OK to have a birds' egg collection – I made a box for mine in school. Shiner Shelton*** married one of the Leaman girls. He was a barber at 2 North St, and then later at 40 North St. He used to ask us teenagers 'Anything for the weekend ?' We hadn't a clue what he was talking about. Smerdon's was at no 4 North Street. The Co-op occupied several buildings – the drapery shop was at 8 North Street, (this later became the pet shop) and the bakery was at no 30. The Co-op butchers was next to it, and the main grocery department was opposite at number 19. Minnie and Mabel Butler had a haberdashery shop at 14 North Street – one of them used to give piano lessons upstairs. Mr Mann had an accumulator shop at 4 West Street, and a shop across the road at 3 West Street. Accumulators were used for running radios – they were made of glass, and you could see when the acid was going down. You then took them into Mr Mann and exchanged them for a new one. Mrs Sly was the Sunday school teacher – she lived in a big house opposite the church. Her parents had had a dairy. Dickie Jones was the choirmaster until Maureen Daymond came in 1954 or 55 – he was the husband of Amy Jones. Miss Hern lived in a large house just beyond the bridge at the end of Chuley Road. The house was at the bottom of a steep valley, which got filled in when the A38 dual carriageway was built. The house had oil lamps - no electricity. She had an orchard with cider apples, and a large cider press in the barn. We boys used to 'scrump' the cider apples, even though they were horrible. In those days the quarry excavated black marble - it was quite famous. There is some at the South Dartmoor Community College. ** Goosepool Lane on the 1840 tithe map. *** Bill Shelton married Rhona Leaman. Thanks to Linda Phillips for this information. My sister Margaret and I arrived in Ashburton at Easter 1945. We came straight from boarding school to the Vicarage, our new home; our parents had moved from North Devon while we were away. We were thrilled with the lovely Queen Anne house with its large garden, lots of room for us to play outside and a large bedroom each. We were 11 years old and had spent the first years of our life in a small village, so this was an amazing change. Ashburton was a small market town but it seemed quite a large one to us. Just a few thousand people lived there then, and much more traffic going through than we had known. There were four main streets with a Bull Ring at the crossroads,a large stone edifice with large iron rings set into it on all sides. It was very old , and presumably used to tether bulls during the cattle markets, for sale or for hire maybe. There was also a Pannier Market, with many stalls or stone shelters where people would come into the town to sell their wares. I remember a Medieval Fair one year when we all dressed up and processed to the Market and sold the contents at our various stalls. Margaret and I dressed up as nuns and helped at a Church stall, my sister sold a lot of tiles she had painted with Saints and Canterbury Pilgrims! Many years later, long after we had left, it was removed for a large car park, much needed for a rapidly enlarging town. West Street, where we lived, went out towards Plymouth, East Street met at the Bull Ring and continued on to the Exeter Road. Across from these was North Street, leading up to the moor and the Ashburton marble quarry. Last was St Lawrence Lane leading down to the Cattle Market and the Railway Station. In that street there was an old building which once had been a Grammar School but in our time was a Junior School and the Library. 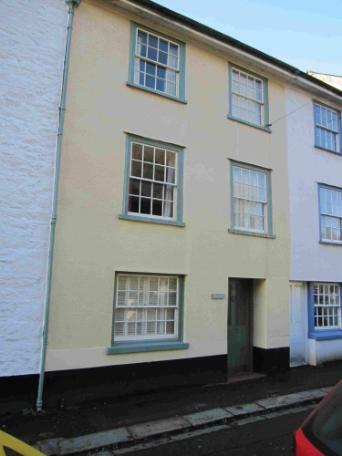 The older children went by train to Totnes to the school there.. This Lane became flooded very quickly in torrential rain and the owners of the town houses there all had flood boards,to insert in front of their doors to prevent the water entering their house! The town had a Portreeve instead of a Mayor, and was appointed every few years, with an inaugural procession up to the Town Hall and every year there was a Portreeve's Dinner. In the summer we danced in the streets a floral dance with a band playing and we danced a folk dance to a particular tune. We noticed that we lost some dancers as we approached a pub and there were quite a few of those on our route--but they returned later! 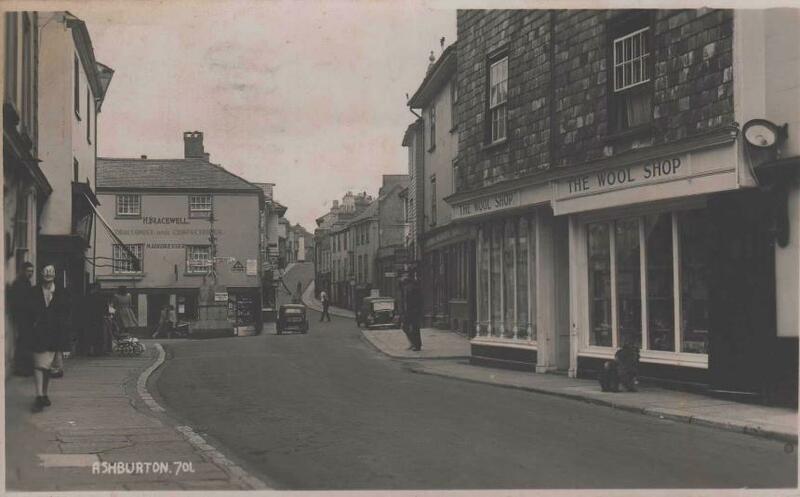 Above: The Wool Shop - 1940s? Also in the picture is H. Bracewell's at 2 North Street. A tobacconist and confectioner, the business also incorporated hairdressing. There were several shops, owned by the people in them who were so friendly, we knew them well. The Misses Butler, two lovely, smiley ladies owned the wool shop with lots of millinery items and their beloved cats were often on the counter. They were Sacristans at our Church and also ran the Sunday School. There were about 100 children who came every Sunday to the Church Hall and were given a little book to put a sticker in ( appropriate for the lesson they were taught.) We went of course and it was rather enjoyable. Every year they all went in a bus for the Sunday School outing to Teignmouth with 6d to spend! Also there was a Sunday School tea, lots of food such as large buns with cream and jam and many different kinds of cake with squash, a great treat for us all. Then each child was given a Sunday School prize, a book for them to take home. I’m sure most of the food was provided by the large bakery, Barnes, all cooked on the premises. Then there was the ironmonger’s Churches, we loved looking round it and you were able to buy just one candle or screw or nail etc. There was a greengrocer and a grocer's shop, Parsons , who delivered your order to the door and would send up to your house with an assistant anything you had forgotten. My mother paid her bill at the end of every month. There were three banks: Lloyds, Midland, and the National Westminister, and a Post Office. There were buses going through from Plymouth to Exeter and also to Newton Abbot - so it seemed such a busy and friendly place to live in. A man arrived once a month to the Church Hall with an evening of pictures to show us. They were in black and white and silent but we did enjoy it all - Charlie Chaplin, Tom and Jerry, Abbott and Costello, as well as a main film. When we first arrived in Ashburton there was a slum area. I visited the homes with my father shortly before they were pulled down and new housing built at the top of North Street. We loved our time in Ashburton and we still visit from time to time - to a delightful but very different town from what it was nearly seventy years ago. We lived in a bungalow called Greenside, just above where Janet, Caroline and Robert Dawe lived. Marion and Jim Dawe were their parents, and Marion was Irish–I remember a Monsignor from Buckfastleigh visiting her. The grandparents of the children lived in a farm farther up the hill* leading to Buckland in the Moor, and I remember helping them do some haymaking and perhaps planting potatoes. I was only about ten or eleven then. There was a disused mine shaft on the farm property and my brother Terry and myself were a bit leery of that. I don't know whether it was properly closed or not. When I lived in Ashburton, Wilf Dawe worked on the farm but lived on the housing estate just across the bridge and towards Holne Cross. Wilf was Jim Dawe's brother, and Wilf and his wife had a daughter Pat, and also a son. It is very likely that upon the death of his parents, Wilf and family moved into the farm. I remember that one of the Dawes was a good artist. The Masters family lived in the Druid area. Shirley Masters came to Toronto and was a nurse; she married a lawyer, I believe. There were two other Masters girls, Jane and Marion. Jane was beautiful and married a farmer. Marion married one of the Armstrong boys–I think his name was Tony. The Armstrongs lived on a farm on the way to Newton Abbot. There were two other Armstrong boys: one was Michael, who was articled at a solicitor's office in Newton Abbot. They were all involved in the Young Conservatives Party, as was I. Upon leaving Ashburton High School/Greylands, I worked at H.B. Cook Hairdresser, where I served an apprenticeship. I worked there for just over three years and then emigrated to Canada with my mother. During the time I lived in Ashburton there was not a lot for teenagers to do for recreation; for instance, there was no cinema and once or twice a week my mother and I used to go to Newton Abbot and sometimes Torquay to see a film or movie as we call it in Canada. There was an excellent tea shop in Newton Abbot called Madge Mellors. I do really miss those days and didn't really appreciate the beauty of Devon and England as a whole until I left.